Delicious, Cheap, and Easy Whole Wheat Wraps! Some of my bloodpact blogging friends have written recipes, and I thought I would add one of my favorite and simplest recipes to the mix. Wraps are a great food delivering device, be it for eggs or veggies, meat or rice and beans. 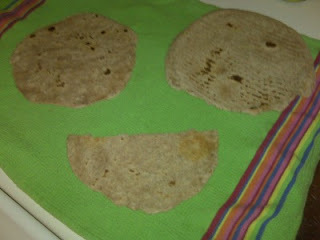 It also happens to be easy to make your healthy wraps without any special tools, for roughly 10 cents a piece! Best of all, you can use as few as two ingredients if you so desire. Mix all the ingredients together in a bowl, adding extra water 1 tablespoon at a time until it forms a cohesive ball. Knead it for a minute or two and then divide into 2-4 smaller balls, depending on if you want large, medium, or small wraps. If you are patient, put them back in the bowl and cover with a towel for about 10 minutes. Now roll them out. For this I recommend rolling between two non-stick surfaces, such as flexible cutting mats (a dollar store or grocery store should have 3 packs for $3-5), silicone baking sheets (also can be had for a few bucks), or something similar. So put a dough ball on a non-stick surface, then optionally put another on top. Now roll it out with a rolling pin if you have one, or a bottle of wine/oil/beer if you don’t. It is easiest if you flatten it out by hand as much as you can first! It may take a couple tries to get them as flat (and as such wide) as you like, but you will definitely improve. Or you could just get a tortilla press online, though I have yet to give in. Now heat a pan on the stove to medium-high heat. Once it seems up to heat, throw a wrap on the pan (no greasing necessary). After 15-30 seconds you should be able to jiggle the pan and have the wrap freely slide around, and this is useful for ensuring it doesn’t burn. Give it about 1-2 minutes on that side, until you start to see a bubble or two, then flip it over for another 1-2 minutes. Now sit it on a towel to cool, and repeat for the rest of your future wraps! As they are delicious warm, I like use one right after I make them. I love making these wraps because it is much cheaper than buying them, can be as healthy as I want, and makes eating them much more enjoyable knowing that I hand-crafted each one. Common uses are eggs with veggies in the morning or your typical taco fare. You can also make mini flatbread pizzas, or sandwich some cheese and veggies in between two for an extra tasty treat! Let me know what you think! Yes, it is similar to Chapathi although not with durum flour.